MiniSat is a small, multipurpose satellite bus developed by INTA, the Spanish space agency. It is intended to form the basis for several series of satellites including ones for scientific applications (such as astronomy and microgravity), Earth observations, and communications experiments. 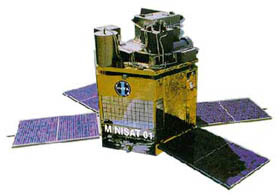 Minisat-1 – the only Minisat to be launched to date – carried an extreme ultraviolet spectrograph, a gamma-ray burst detector, and an experiment on microacceleration in liquids.